Maccabi Electra Tel Aviv picked up its fourth straight win, downing Panathinaikos Athens 75-68 in Nokia Arena on Thursday night. 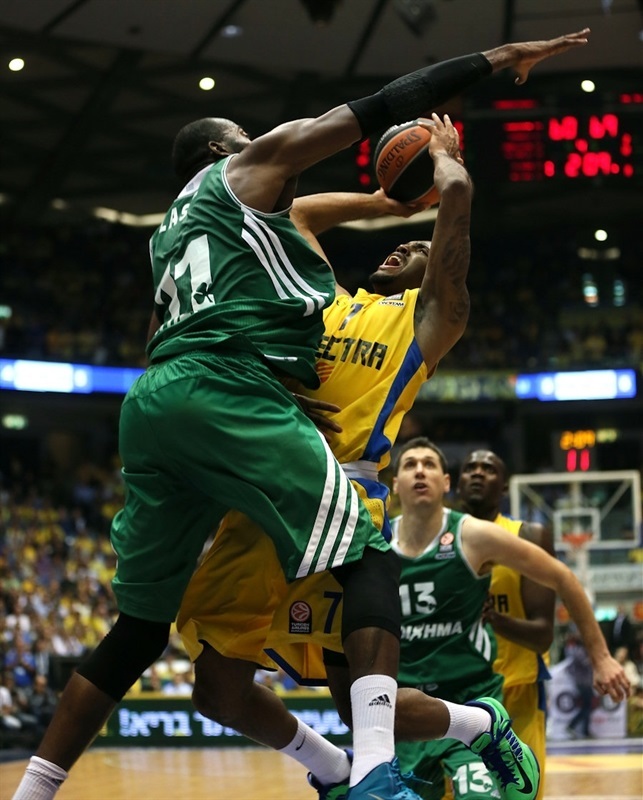 Maccabi improved to 4-1 to keep its share of the Group D lead, while Panathinaikos dropped to 2-3 and a third place tie. In the clash between the two Euroleague powers, the hosts put together a 14-2 spurt in the first quarter to grab a double-digit lead that they never relinquished. 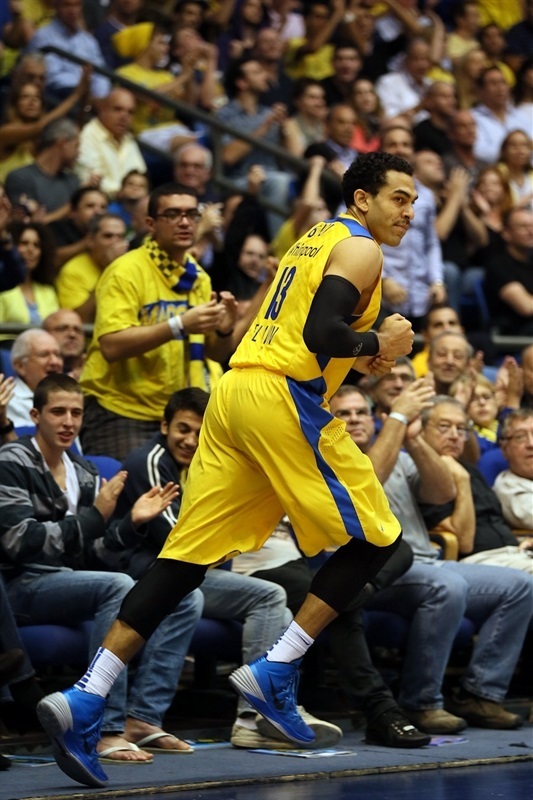 Behind its balanced attack and strong defense, Maccabi led 36-29 at halftime. Nikos Pappas and Stepahne Lasme kept the Greens’ in the game as Panathinaikos cut it to 60-54, but triples from Joe Ingles, David Blu and Ricky Hickman sealed the deal. Blu finished 14 points plus 7 rebounds, and Ingles also scored 14 points in victory. 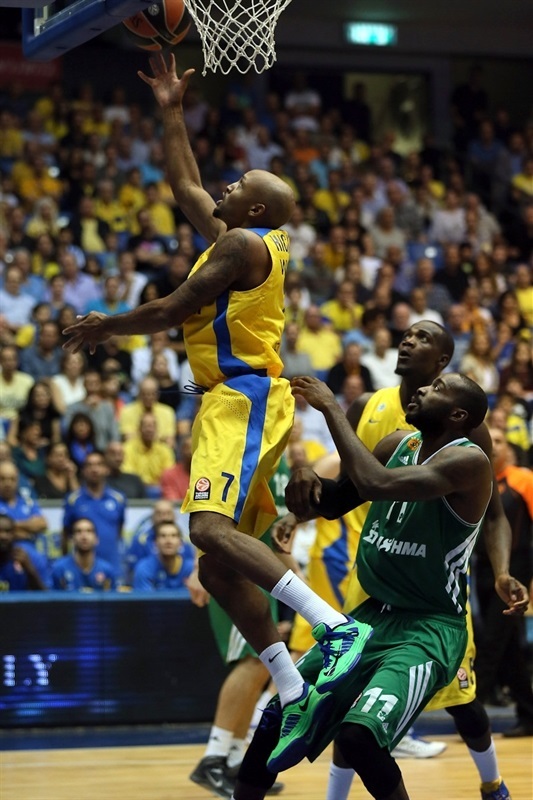 Hickman added 13 points, Shawn James had 12 and Devin Smith netted 10 for Maccabi. 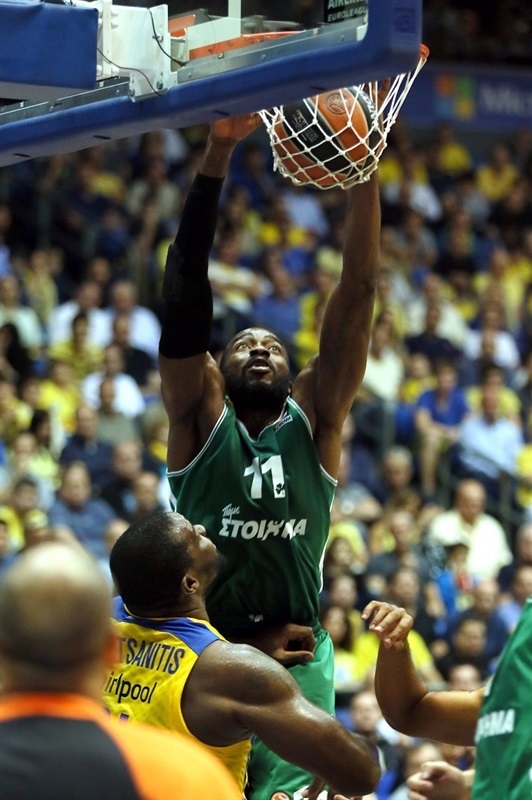 On the other end, Lasme collected 13 points, 7 rebounds and career-high 6 blocks for Panathinaikos. Pappas scored 12 and while Antonis Fotsis had 8 points plus 7 rebounds. 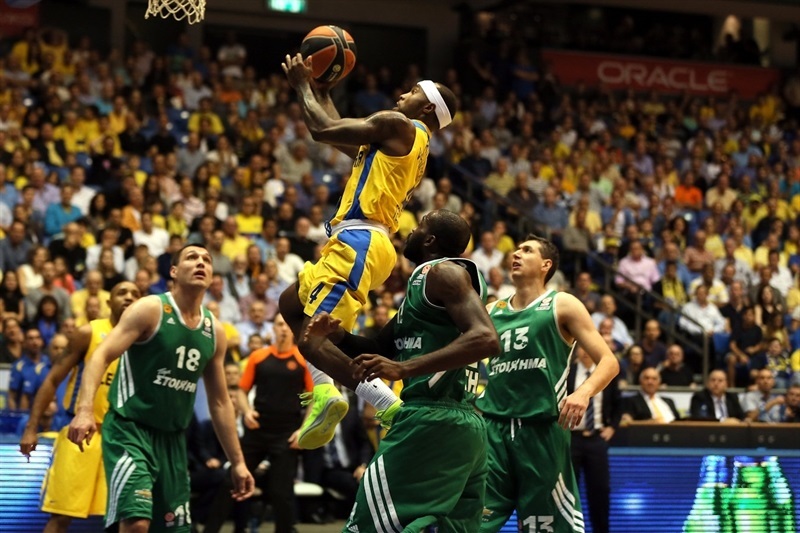 Maccabi opened the game with some stingy defense, and flashy plays on offense. Hickman opened the scoring with an alley-oop dunk before Smith nailed a triple. 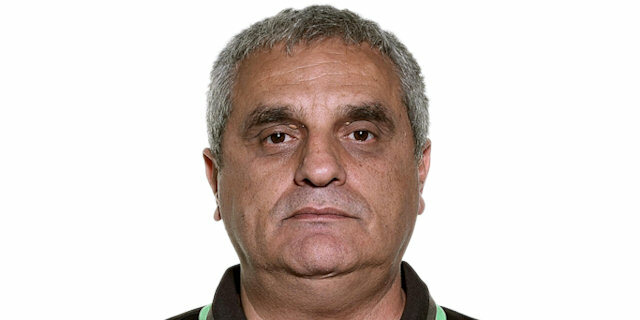 Panathinaikos converted only its fifth possession, and it was Lasme one-handed alley-oop slam assisted by Dimitris Diamantidis. On the other end, James answered with a dunk of his own for a 7-2 lead. Diamantidis and James Gist countered with back-to-back triples, putting the Greens ahead for the first time, 7-8, but a basket-plus-foul from Ingles started a 14-2 spurt from the hosts. The hosts went to the charity stripe on three possessions, sinking all 6 free throws, before Hickman drove for a layup and Blu nailed a triple, 21-10. After a Panathinaikos timeout, Mike Batiste hit a jumper, but Sofoklis Schortsanitis made a put-back and Blu ended the first quarter with 2 foul shots for a 25-12 advantage. Fotsis sank a three-pointer to start the second quarter, and after James replied with a tough layup, Nikos Pappas made a put-back, 27-17. Smith and Lasme traded dunks, before the visitors started dominating the paint on both ends of the floor, with their defense not allowing a single point for more than five minutes, and a presence on the offensive rebounds giving them several second chances. Pappas drove for a layup, and raced for another one on a fast break for 29-23, but after that the Greens did not score for almost four minutes either. A put-back from Loukas Mavrokefalidis made it 30-25, but James ended Maccabi’s drought with a monster dunk over Mavrokefalidis. In the final minute of the quarter, Ramel Curry hit a tough jumper for the visitors, before Hickman sank 2 free throws for a 36-29 halftime lead. Yogev Ohayon drove for a layup to start the scoring in the third quarter, and he found a wide-open Ingles behind the arc to make it 41-29. Lasme’s dunk got Panathinaikos on the scoreboard in the second half after almost three minutes of play, but James made a put-back and a layup, extending the lead to 45-31. 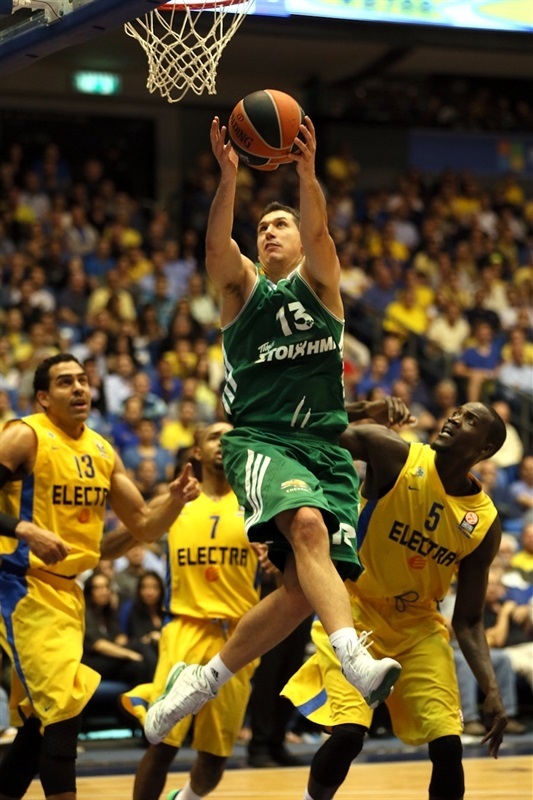 Lasme was the visitors’ lone scorer until Diamantidis made a pair from the free throw line to cut it to 47-37. Ingles and Fotsis traded triples, before Roko Ukic drove for a layup for his first basket of the night, cutting the deficit into single digits, 50-42. 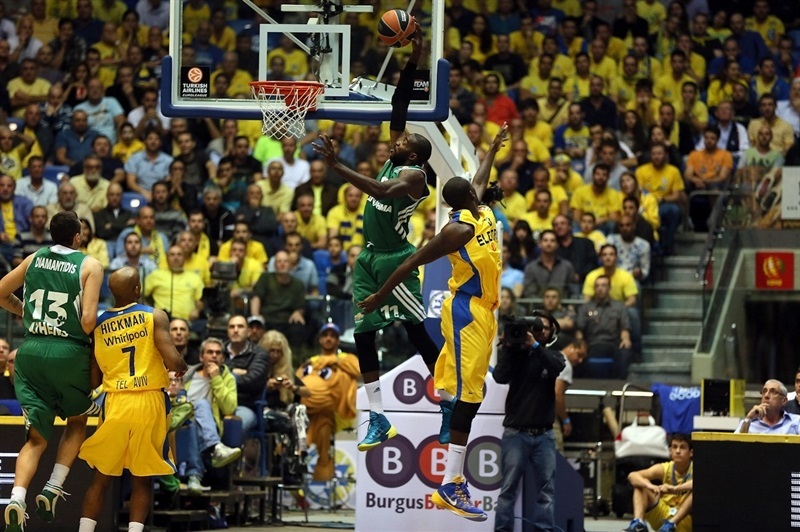 Gist added a basket-plus foul for Panathinaikos, but Schortsanitis muscled his way inside on three consecutive possessions. Fotsis ended the quarter with couple of free throws, 56-47. In the beginning of the final quarter, Smith drove for a layup, but Pappas answered from downtown. Blu nailed a jumper to extend the lead back to 10 points, but free throws from Maciulis and another driving layup from Pappas cut it to 60-54. Ingles answered with his third three-pointer, and Blu scored behind the arc from the right corner to keep the hosts with 66-57 lead. The hosts did not allow a field goal for more than five minutes, while Hickman nailed another three-pointer to make it 69-58. Bramos hit a triple to give the visitors hope, but James threw down a two-handed slam and Blu added a pair of free throws to make it 75-63, closing out the game. In the final minute, Fotsis hit from long range to round out the scoring.
" I’m pleased with this win. I don’t know if people understand the meaning of this win, but we beat a very good team. We are in a busy period and the players are tired, so to come and play the defense that we did is respectable. You could see that we came ready for the game. The fact that we played on Sunday allowed us the practice on Tuesday morning after a full day of rest on Monday. That helped us. " 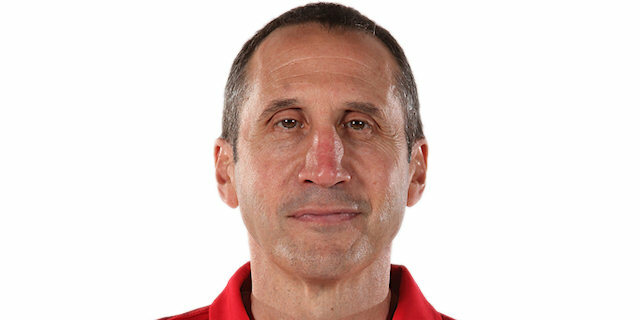 "Maccabi was better. They controlled the game. We had fighting spirit, but did not play with the necessary patience on offense. 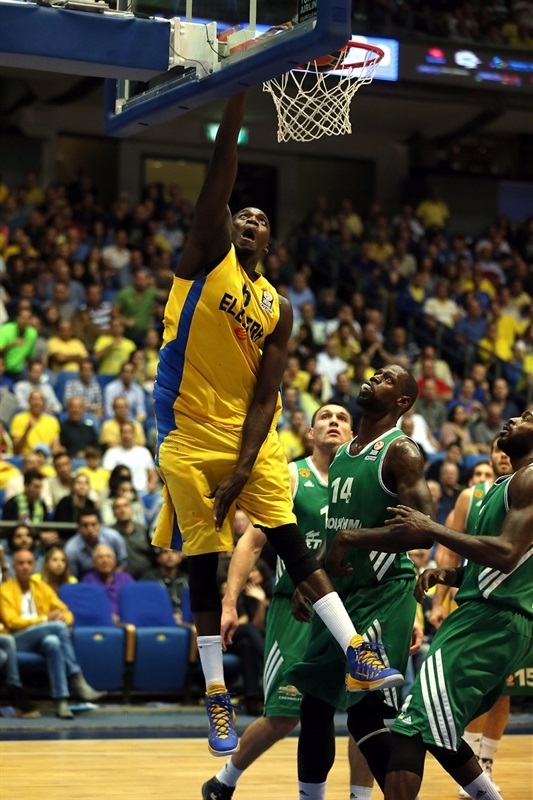 The mistakes we made at critical moments allowed Maccabi to get the win. We were nervous and we paid for it. We are judged as a team rather than as individuals. Everything is a team effort. We had some specific problems, but we insist on being judged as a team. "